Welcome back to Social Contract from below. First things first, thanks to everyone who took the time to leave comments on my last article. I really am getting a kick out of interacting with all of you (I have a habit of replying to almost all my comments) and it’s a huge boost for me to know that people are actually reading what I write. Also, I was recently on the podcast itself (Season 9, episode 5). I’d love to hear how you think I did. Big shout outs to William for letting my dip my toe in the podcasting pool (and editing it so I didn’t sound like a complete idiot) and to Chris for coming on so it wasn’t just me (even if he thinks Dromar, the Banisher is crap. #TeamDromar for life!). There are several elements of the social contract that have to do with the cards we play. All of have dealt with (mostly new players or “competitive” GP pod grinders) who play cards/ build decks that violate the social contract we’ve come to expect as commander players. However, the other major violations of the social contract come from intangibles during a game, such as collusion, revenge plays, or poor threat assessment. However, in my not so humble opinion, the biggest offender is slow play (This came as a shock to no one who read my article deriding Sensei’s Diving Top). Today I’m going to give you two rules that my playgroups have developed to try to keep the game moving. Many of you will find that you do these already. While they do slightly break the rules of the game, the level of exploitability is minimal. The rule reads: Any spell trigger that would cause you to search your library and would not impact the turn is done at the end of the turn in the order they would have resolved, the next player begins his turn while the player searches. Any plays that would be relevant to the searched for card are also delayed. Any player may request to resolve the search at the “normal” time. This rule may not be exploited to create an advantage for any player. This applies to sorcery speed tutors and other searches that happen during your turn. If you cast something/trigger something that will cause you to search (for examples’ sake, let’s say Demonic Tutor), If you are doing nothing else that turn, you then pass the turn while you search. You will have to keep an eye on the player to your left’s plays if you want to interact with them but this way the other people at the table don’t have to sit there and watch you search and shuffle. Obviously if you want to cast the spell you have tutored for you can resolve the search as normal but it gives you the option to save everyone a little time. Here is a more complicated example. I have out Momir Vig, Simic Visionary and I cast a Wistful Selkie. I have both the “green” search trigger and the “blue” reveal trigger. Since both triggers trigger simultaneously I can choose the order they will be put on the stack. If I choose make it so the “blue” trigger resolves first then only the “green” trigger would be delayed. However, if the “green” trigger is set to resolve first then both the green and blue trigger would be delayed as the object that would be effected by the blue trigger (in this case the top card of the library) would be effected by the green trigger. The last sentence in this rule is very important. If by following this rule you can create something that should not happen because of the rules, you cannot do that. For example you cannot delay a trigger so that you have a Hellspark Elemental that lives through an end step where it would not normally exist. Bottom line: Don’t try to rules lawyer this rule! 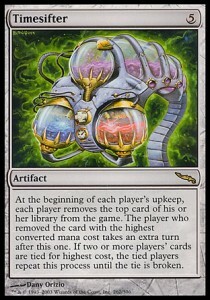 The rule reads: When a player would make a choice that would involve multiple cards that may be cast/ activated at instant speed, that player may cast/activate that ability during the player after them with the idea that they are activating it on the end of the opponents to their right’s turn. If the game state changes and the player who cast/ activated the ability wants to change their choices, they may. If a player does something that would affect the areas affected (such as a shuffle effect) then the ability is undone (if necessary) and the ability is then redone, assume the ability to cast the spell/ activate the ability is still there. Any player may request to resolve the spell/ ability at the “normal” time. This rule may not be exploited to create an advantage for any player. That is a very wordy couple of sentences (BTW the Magic comprehensive rules is just over 100 pages of this. Whenever I cannot sleep I curl up with the comp rules, crack it open to rule 602.2, and I am out in 10 minutes) but it’s really not that bad. Let me give you some examples. 1) If I have out top, during the player to my left’s turn, I can say “end of the player to my right’s turn, I top. I then resolve my top while play continues. If something come up during the turns and I want to change it, I can. 2) I have top out and “at the end of your turn” during the player to my left’s turn. The third opponent casts Collective Voyage. After it resolves (and I search up my lands) I will then top again as though I did it on the end of player’s three’s turn. 3) I have top out and “at the end of your turn” during the player to my left’s turn. The third opponent casts Warp World. After it resolves I will not get to top again as my means of topping was warped away. 4) I “at the end of your turn” Enlightened Tutor during the player to my left’s turn. The third opponent casts Warp World. Before Warp World resolves I will untap my mana and put the tutor back in my hand. After Warp World resolves I will get to tutor again as it’s as if I cast if on the end of the turn of the player to my right. Again the same rules apply as the last rule. You can’t use this rule to break the “real” rules of the game and people who try to rules lawyer this will be taken behind the card shop and have unspeakable things done to them. Now should these rules be used if you are playing for prizes or if your group members are sticklers for rules? Absolutely not. Should you ask your group before you just do them? Duh. However I hope these rules can help fight the menace that is slow play in constructed. As always I love to hear what you people think. Feel free to drop me a line in the comments, email me @ noleclauson@gmail.com or shoot me a twitter at @mtgnole. I’m thinking of doing an article about social contract problems you see in your local groups. Think of it like a Dear Abby for commander players. If you have something you’d like me and my crack team of experts (aka the little voices in my head) to try to solve please send me stuff. I’ll credit you if you want (you can go the dear Abby route and sing your letters with some cutesy title like “the sliver king” or “sick of slow play in Seattle”) or I can leave your name off it all together. However this only works if you send me questions. I’ll be back in two weeks when I’m going to tackle another topic in commander. While I won’t say what it is here is a hint: http://www.youtube.com/watch?v=68ugkg9RePc.